Ride around Bangkok in the ever-stylish Tuk Tuk in this non-stop tour through the picturesque streets of Bangkok! 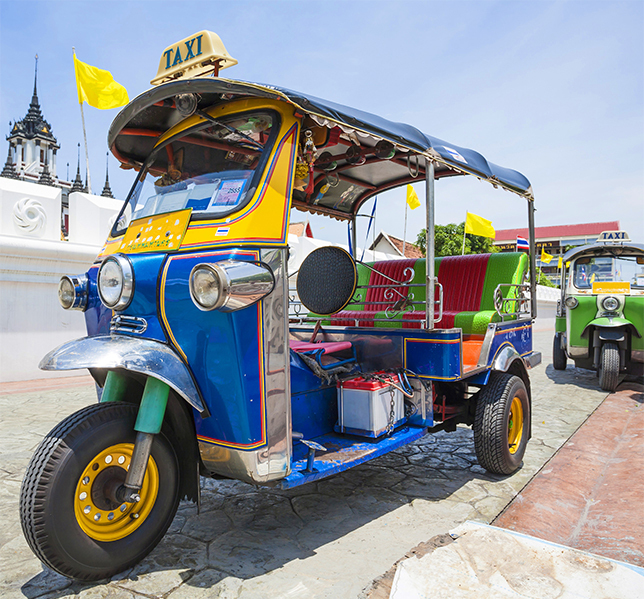 You will get the chance to ride your very own Tuk Tuk, of course with the supervision of your local guide, where you will whiz through the bustling streets of Bangkok like a local onto your next tour spot. Your first stop is the Phra Sumeru Fortress, a well-preserved building dating back to the 18th century. 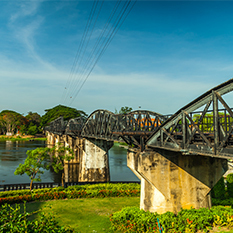 You will also pass the Thammasart University where your guide will teach you a few facts of the history surrounding this area. Next stop is the Amulet Market, a place you to mingle with the locals while picking up a few gifts for yourself. 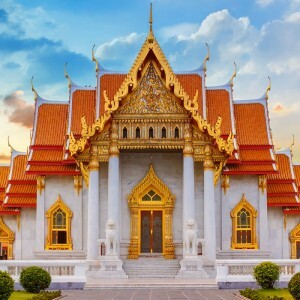 You will find traditional Thai amulets, charms and medicines, as well as seeing the Wat Po, the temple that is the centre of the Buddisht religion and the birthplace of Thai massage and medicines. After leaving Amulet Market you will head back in your Tuk Tuk and continue onto your next highlight of Bangkok, which happens to be the Phahurat Market, located in the heart of Little India. Fabrics, cloths, ornaments and accessories and Indian snacks can be bought from here. This unique market simultaneously blends Thai and Indian culture together for a wonderful afternoon of experiences. The Khlong Thom quarter is next on the agenda, also known as the Thieves Market, stocked with antiques, second hand furniture and an array of goods. Origionally named the Thieves Market due to its produce being from stolen goods, however this is not the case today. You’ll head back onto your Tuk Tuk after an interesting browse through the market, finding yourself at Wat Saket, a temple that lies at the foot of the Golden Mount. 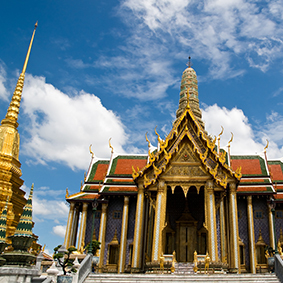 Climb up the 318 steps to find a magnificent 360-degree view of the surrounding old Rattanakosin Island. From here you can decide to explore further or your local guide will be happy to guide you the way back to your hotel. This Bangkok Tuk Tuk experience is available daily all year round and starts at 8.30 am, the tour lasts around 4-5 hours. The dress code is casual however please note that part of the tour vists a religious temple and knees and shoulders must be covered when entering. Are you interested in adding the Tuk Tuk experience to your honeymoon in Bangkok? Contact us today!